The jib cranes, gantry cranes, overhead cranes, and workstation cranes we sell are all built to last many years and their lifespan typically exceeds the needs of the task they were installed to do. 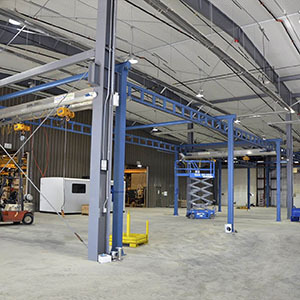 Upgrading, or re-purposing a crane by relocating, it can save a client from a new capital purchase and extend the use of their existing material handling equipment. Re-locations are a complicated project management affair – with two sites to consider, the logistics and potential problems are doubled that of a new installation – so good planning is key to success. Our project team managers are experienced in complex crane movements, crane and track modifications and all types of crane installations and facility configurations. Beyond having a great office team to plan out the move, the Acculift install team is made up of certified crane inspectors, so they’ll be able to spot any potential pitfalls and equipment concerns during the move. As well, with many years of experience, they might be the very team who originally installed your crane so their ramp up to your situation will be much faster than any outside team. During a crane relocation, many clients also take the opportunity to modernize or replace components of the crane, such as the hoists or control systems. Also, modifications to the crane are sometimes required to fit the new space such as reduced or expanded crane reach. In terms of lifting capacity, rarely does the new lifting requirements exactly match the old, hence looking at upgrading equipment at this time makes good financial sense – many hours of installation can be saved by thinking ahead in this regard. Why do our clients relocate cranes? Typically, customers relocate cranes as their shop configurations change, or if they move buildings. Processes change over time and the nice thing about our crane systems is that we can adjust and move them to accommodate the new processes. What are some of the reasons you can’t relocate a crane? One of the main reasons a relocation wouldn’t be cost effective is if won’t physically fit in the new location – and to make it fit would be cost prohibitive (modifying columns or beams to fit). Re-locations that involve structural building modifications can get expensive as the customer would need the involvement of a structural engineer and structural fabrication/welding company. Another reason would be that the integrity of the new floor or structure may not be sufficient for the expected load of the crane. Again, this would involve a structural engineer and approved contractors to make the necessary changes. Another reason would be that the integrity of the new floor or structure may not be sufficient for the expected load of the crane. Again, this would involve a structural engineer and approved contractors to make the necessary changes. We would look at both of these factors, and many more, to ensure a relocation is a right choice. What makes a crane relocation a better option than buying new? It’s so much more cost effective. One example is for our clients that have Gorbel freestanding crane systems. Gorbel Cranes are manufactured in such a fashion that they can be added on to, or diminished, if necessary, to fit specific applications. A Gorbel crane can be put up in one shop, used for several years, taken down and moved to a new facility. One major benefit of this is that the employees know exactly how the crane is going to operate after it’s back up in the new place, minimizing the impact on production. What can the customer do to make a crane relocation easier and smoother for installers? Customers can make a relocation dramatically easier by having the areas in both locations free and clear of obstructions. The power and air connections need to be unhooked prior to our arrival as well. Clean areas are safer and make for a faster install. If we have to work around existing equipment and stock, or if we have to move obstructions, it slows down the installation and ultimately increases our time spent on a relocation. What equipment is needed on site for a relocation? Commonly we would use a forklift, scissor lift, and all our hand tools. Sometimes, we use a manual crank lift. It all depends on the equipment being repositioned. What has to be calculated and planned before the relocation can happen? Before the relocation, we need to know that the existing crane will fit the new location. Every crane is custom and would have been designed to fit in the original spot for various reasons. We have modified cranes to better fit the new location, though. Examples are: Shortening and lengthening columns because of headroom, extending the crane, and shortening the crane (not using all of the support structures and runways). If you could have one ask of a customer, what would it be? The one thing that makes or breaks a relocation is how clear the areas are of obstructions. If we can have both areas wide open, and no interruptions from other contractors or people in the area, that makes us much more efficient and effective. What types of cranes do you relocate? Any of the crane brands we sell we are able to relocate, move, or repurpose for our clients. Is there a pre-inspection? Engineers? Electricians? When do they come in? There is no “pre-inspection” as such. Each piece, as its dismantled, is examined for damage. The reason for this is that if we don’t catch it before transportation and/or installation, there will be delays in the install. The customer is responsible for having an electrician disconnect power before we arrive. Break it down, what’s the process for a crane relocation for Acculift’s install crew? First off, we come in and unpack our tools. We set up a convenient location for our tools for the duration of the job. If the crane is equipped with power and air we ensure that they are unhooked and it is safe for us to start taking it apart. The festooning is the first to come down, then we remove any hoists, we remove the bridge, then the runways. Following that, we remove the headers and remove the columns, ending with a sweep of the area. Depending on how the job is arranged, or what the customer’s needs are if the crane is going to a new building we would generally strap it to pallets and arrange a truck to transport it. If it’s going to be put back up in the same building, we would use carts to transfer it to the new location. Once we’ve established the new location, we lay it out on the floor with a laser and reverse the above order to put it back up. We then perform an inspection of the system and do load testing to ensure that the equipment is performing as expected. What’s your biggest concern on a crane relocation job? Safety. We follow all of the client’s safety protocols and adhere to our own strict safety protocols. No one wants a workplace accident and we do our very best to ensure our crew gets home safe. After that, my biggest concern on a relocation is that the old crane will fit the new location. Every relocation job is different, so this doesn’t always apply, but the accuracy of measurements and planning alleviate most of this concern. Another problem we encounter while on site is that the old equipment is deficient. This can cause unwanted delays if parts are needing to be ordered. It’s the big equipment that has been moved into the shop that may not have been there when the crane first went in that makes a relocation tricky. Working around and moving large components around permanent equipment is always a concern. Caution and deliberateness are our allies in a relocation. What’s your biggest logistics issue? Our biggest logistics issue is coordinating the transport company to arrive at the right time for deliveries and pickups of equipment. If we get the crane down and ready for transport, and the transport company doesn’t arrive within a very short amount of time, we are going to be wasting time. We want to do the takedown and install back to back to minimize wait times; however, if we are coming back at a later date, we don’t mind if the crane sits for a while at the customers’ location. It also works the other way too; if we arrange the transport company and aren’t ready for them when they arrive, we are wasting their time and our money. How many people are usually involved in a relocation? Usually, only two people are required for most relocations. We can always bring in more people if the job warrants it but two people working together well, seems to be our optimal team. What about electricians and engineers? Our salespeople? What about the client’s people? Electricians, engineers, our sales people and the client’s people generally are not on the job the same time we are during a relocation. They will have come and gone before our install crew arrives. Engineers, if needed, will assess the structure or mounting components of the building and provide a stamped approval drawing or letter prior to us installing our equipment. Electricians generally come after we are done to do the final connections and to connect the crane to the existing power supply. How can the customer be assured the relocated crane is safe? Relocations are installed like a new system. Our Acculift checklist process is the same for installing a new system compared to a used one. Every piece is inspected and installed individually, giving us the opportunity to spot and/or report a deficiency. We wouldn’t authorize a crane for use unless we feel that it is 100% ready for our client’s use. How do you follow up with a customer? After we complete the install we do a load test. It’s part of the completed installation checklist form that all Acculift installations receive for quality control purposes. At that point, the crane is ready for use. After that, the sales team follows up with the customer to discuss the project with the client and get their feedback on the process and job completion. Read more about relocating your lifting equipment here.